September | 2015 | We Can't Hear the Mime! Inside-Out sees a union of the new capabilities of photo-realistic CGI with a more retro, colourful style thanks to its dual story structure. The action takes place simultaneously in a realist grey-toned San Francisco where 11-year old Riley suddenly finds herself after a house move and also in her head. Her mind is run by five emotions, personified into glowing fibrous beings. The film is essentially one short narrative about Riley accepting her new home accompanied by an incredibly intricate allegory of the same story. The allegory in fact is so powerful that you come to care about these figments of a fictional character even more than the fictional character herself. The journey of Joy (Amy Poehler) and Sadness (Phyllis Smith) through the furthest reaches of Riley’s mind controls the “real-world” action but is more colourful, more poignant and more alive than the San-Francisco streets that Riley so hates. 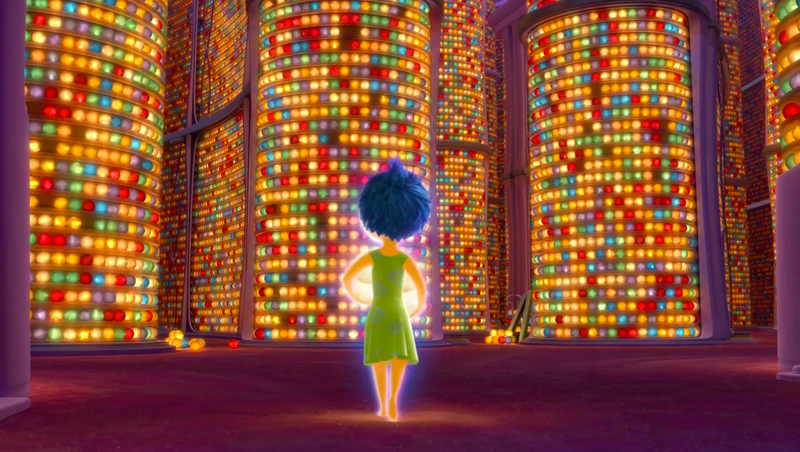 The emotional punch of Inside-Out comes from its grace and delicacy. From being an over-bearing dictator in the film’s first act, rejecting anything that isn’t happy, Joy slowly learns to understand and appreciate the value of the other emotions, especially Sadness. It’s a sweet way to understand the loss of childish innocence and the emergence of a subtler, wider personality in the young girl. In one of the best scenes Joy reassures herself by playing an old memory of Riley skating and dances along. Quite apart from the beauty of the shot this scene demonstrates a real care and attention to detail as Riley practices genuine Ice-Skating moves in a very realistic way. Yet there’s something unsettlingly familiar and safe about this fantastical world of the long-term memory. Who can forget the great chase sequence through airport conveyor belts in Toy Story 2, or for that matter the door warehouse in Monsters Inc.? Well, if you liked complex, illogically large, multi-coloured mechanisms you’re in for a treat because that’s exactly what the long-term memory looks like. Furthermore, while Bing-Bong is undoubtedly the unsung star of this film, his story arc of the loveable companion who accepts that he must leave for the heroine’s own good can’t help but remind us of Sulley and Boo and an altogether more creative and original time. This entry was posted in Film Reviews and tagged Animation, Disney, Film Review, Inside-Out, Joy, Pete Docter, Pixar, Sadness, Vice-Versa on September 4, 2015 by Flo.